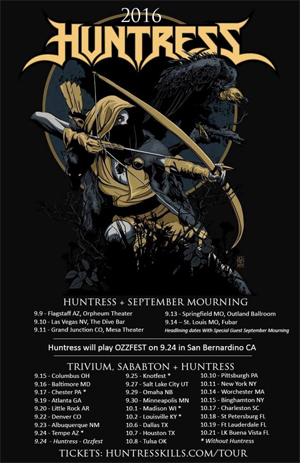 California heavy metal band HUNTRESS kicks off the Fall touring season with a string of headlining dates, a coveted slot on Ozzfest (September 24 in San Bernardino, CA) and as support for TRIVIUM and SABATON on a U.S. run in September and October. The tour marks the band's first full-scale tour since releasing their third album Static in 2015. Vocalist Jill Janus comments "HUNTRESS is in full beast mode again and ready to bring the fury to stages this fall! It is an honor to join BLACK SABBATH at Ozzfest on September 24, and tour alongside TRIVIUM and SABATON. SEPTEMBER MOURNING joins us as direct support on a slew of headlining shows as we kick off the fall tour. HUNTRESS is thrilled to have the chance to really connect with our fans, who've been so supportive throughout our journey. Spread it, shred it, behead it!" HUNTRESS-who is Jill Janus, Blake Meahl (guitar), Eli Santana (guitar), Tyler Meahl (drums) and Eric Harris (bass)--will perform songs from all three of their albums Static, Stabound Beast and Spell Eater, giving fans a versatile show combining authentic musicianship and theatrics. The band is offering a free meet & greet nightly after the show. The HUNTRESS album trilogy Static, Stabound Beast and Spell Eater is available on Napalm Records.